The Bitter Elder. Photo by Donna Turner Ruhlman. It’s race week here in Key West, but my thoughts are with Donna in chilly Cleveland. It’s winter when I most crave bitters in a cocktail. Happily a suggestion on Twitter brought up a new cocktail for me, the Bitter Elder, and before I departed for southern climes, we gave it a go. The cocktail, which balances the bitterness of Campari with the sweet elderberry flavors of the liqueur, makes for a splendid libation, especially for those in the cold grays of the north. I salute you from the southernmost and wish you a happy Friday Cocktail Hour. Stir the liquids with ice in a shaker and pour into a chilled coupe. 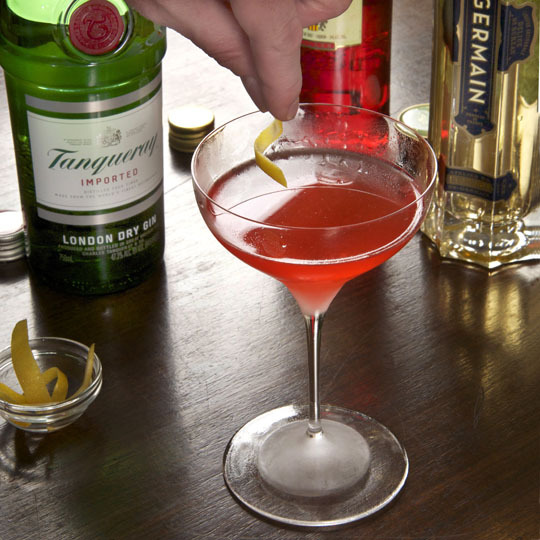 Garnish with a twist. My past cocktails: the Rusty Nail, the Sawyer, and the Hasty Negroni. A recipe for a Campari orange passion cocktail. 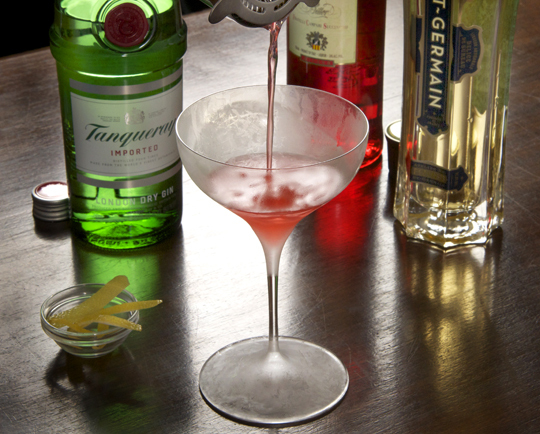 What else you can do with a bottle of St. Germain. Having appreciated your inventiveness and accuracy in your books and blog, I might note that elderflower, not elderberry, is the source for the St. Germain. Bet you knew that and this was just a fast fingers “typo”. I am falling down the cocktail rabbit hole–I’ve got all the hardware and have mastered any of the ‘sours’, mojitos, margaritas, gin and tonics and negronis (hasty or otherwise). What I need to know, is what are the 8-12 must have, go-to bottles that comprise a home bar, please. It took a while to build all that up, but you can create quite a range of classic or modern, fresh and simple drinks with all of the above. Definitely a fun hobby, -enjoy! Thanks for taking the time to write that down! Great info. Anyone else?